The Phantoms sure did “take care of business” Wednesday night at the PPL Center. A 7-goal outburst punctuated by Taylor Leier’s “hats included” hat trick paced the Hamilton Street Heroes to a 7-2 win. It was a game they had to have against an opponent reeling from trade losses and languishing in last place. Tonight’s opponent, the Portland Pirates, come in having lost two in a row; they dumped both contests last weekend. They also haven’t played in six days and will surely be ready for some hockey. The Phantoms ran a half-price hat promo yesterday in honor of Liersey’s hattie. I took them up on it–it’s a nice black CCM/Phantoms lid–but had to mail order because I didn’t know if I could make it downtown in time to pick one up. And of course, I lost a nice black one in the resultant celebration Wednesday. The only unfortunate thing: shipping was almost as expensive as the hat! As you can see, Portland is the top team in a group of teams that are vying for two or three playoff spots behind top-tier Hershey and Wilkes-Barre. A win in regulation not only nets the Phantoms two points tonight, it keeps the Pirates from logging any points. The same will be true in upcoming games versus Providence, Bridgeport and Hartford. The “Binghamton Postulate” applies to the Springfield team–take care of business. The Phantoms special teams have been doing reasonably well of late–including a nice 2-goal power play effort during an “all-you-can-eat” major Wednesday night. The Pirates team has a decent PK unit, but has struggled to score on the power play, ranking only 25 out of 30. Blog favorite Nicky Cousins got his first NHL goal last night for the Flyers. He added an assist and a star of the game, as well. I think I know which jersey I’ll wear tonight…. 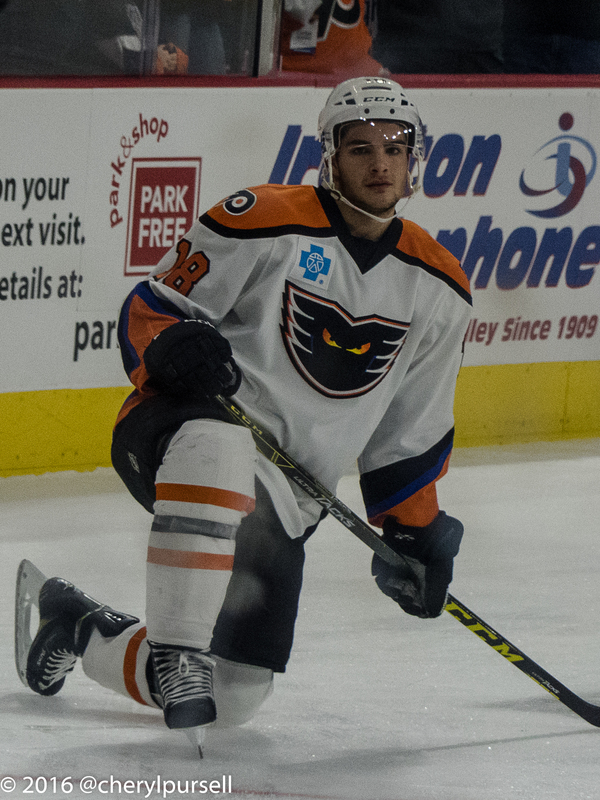 G Anthony Stolarz returned to the Phantoms following practice in Philly yesterday morning. Correspondingly, Marty Ouellette returned to Reading. F Cole Bardreau reportedly lost some Chiclets Wednesday night as he got boarded pretty good. 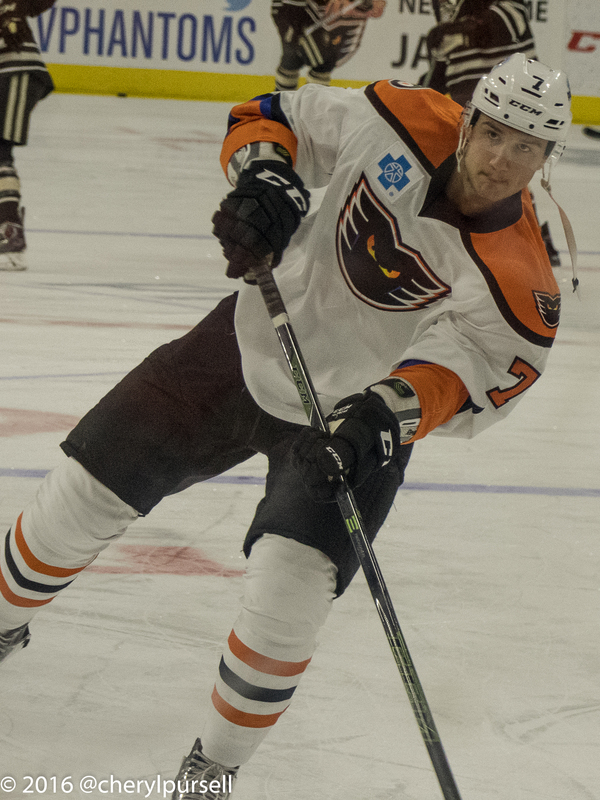 The resultant 5-minute major helped pace the Phantoms to the win, and he returned wearing a full cage. F Petr Straka returned from his injury Wednesday night and looked good logging third-line minutes. The Royals were off on Wednesday, and play tonight in Norfolk. They’ll be home tomorrow to face off against our old friends from Glens Falls. I erroneously wrote on Wednesday that the Royals were not at playoff level, when in fact they are. It’s close, so they need to continue to win games to maintain their position. February is a big month for home games with the Phantoms, but the first couple weeks of March will be really lacking in live hockey. A good time to head down to Reading for a game? Unfortunately they don’t have a ton, either, but take a peek at their schedule if you’re looking for something to do. The Portland Pirates are the AHL affiliate of the Florida Panthers. Tickets and Parking: No parking issues to report; most parking facilities are starting to collect the $6 at 4:30PM or a little earlier for a 7PM game. While seats remain for this game, locations and amounts are sporadic. It may go SRO before game time, but I doubt it completely sells out. Depending on your seating preferences, grab tix if you need them, or explore the secondary market. Security: Click back to other posts for security policies and procedures. Things have been running smoothly as far as my observations go. Promotion: None. However, meat-free menu items are available at many of the concessions for Lent. PreGame: TV goes live from Chickie’s and Pete’s at 6:30PM. I spoke to another fan recently, who mentioned that he really liked watching the show from Chickie’s prior to, during (intermissions) and after the games. Radio pre-game goes on earlier for your drive, around 6:15PM. No pregame meal planned for tonight at this point as I’ll likely be a little later than usual downtown. I hope to make it to the ML Loft to watch warm-ups, then to my seats with the radio on for the game. Pregame Wednesday was at Chickies where I had some excellent seafood and then wings and a couple cold ones prior to the game. Check out the dry-rub wings some time. They were very good on Wednesday. PostGame: Not that I want it to get too crowded, but it’s a cool hang to stop by the Dime bar for some live music and a beverage after the game. As always, watch for who leads the team onto the ice for warm-ups. That’s your starting netminder. I’m fully expecting Stolie tonight, as he never got in a game in Philly, and needs the regular ice time. How things go tonight will likely determine tomorrow’s starter. At this point especially, I think starter will be determined by who gives us the best chance to win on any given night. As with Wednesday, watch Bardreau and Martel as the youngsters continue to assert themselves. Watch to see if the crowd is into it tonight. What kind of hockey town are we right now? These are all like playoff games at this point, you know. We’re back at it tomorrow as our February home-month rolls on. Tomorrow is player photo night after the game. Utica is in town; watch the blog tomorrow for some special guest game previews, as well as your usual Hockey Night primer.